The National Intercentre wa s held in Christchurch last weekend, with Wellington sides in outstanding form. The Women’s side lost only 1 of their 15 section play games in qualifying for the quarter finals. 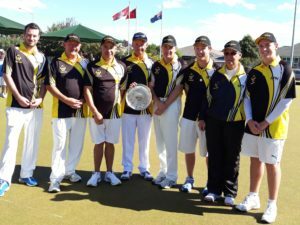 However, they came up against Bay of Plenty in the quarter final and were eliminated loosing the Singles and Pairs. The Men’s side were drawn in a section of 7 and had to play 7 rounds of qualifying to complete their round robin. This did not prove necessary as with a round to go Manawatu on 38 and Wellington on 37 could not be caught by the other teams. In the last 8 they drew Central Otago and won all 3 games. The Wellington team again scored a 3 nil win in their semifinal when they defeated Marlborough. In the final Wellington defeated Dunedin 25–14 in the Singles, 15-14 in the Fours and lost the Pairs 13–19. A great weekend for the Wellington sides and congratulations to Victoria’s representatives Richard Corry, Bradley Down and Ray Martin in the men’s four, Leigh Griffin as men’s manager, and Nicole Toomey and Helen King in the women’s four.